When I played Fauna for the first time, I was rather enamoured. Having grown up eagerly consuming wildlife documentaries, a trivia game about all sorts of animals was right up my alley! 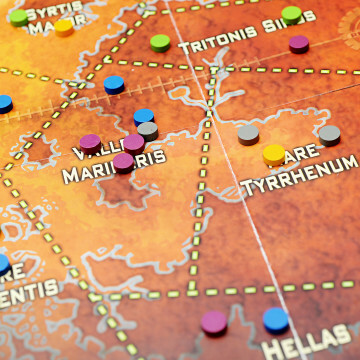 Then, a year or so ago there was a follow-up game called Terra, which took the same trivia / “guesstimation” idea and applied it to all sorts of things from around the world – and again I was enamoured, because not only do I love testing my knowledge of things and stuff, but I love learning factoids and whatnot as I go, which these types of games are pretty great for. Bézier Games (who brought Terra to the English-speaking market) have now added America to this wonderful family of party/trivia games “where close counts”! 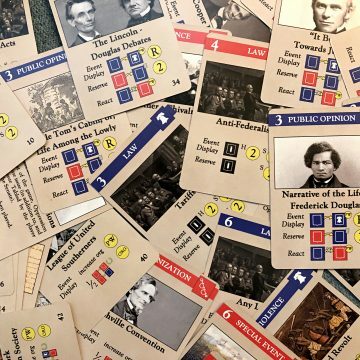 Now, you might be wondering how a game all about the USA could have a market for board gamers everywhere, and I had wondered the same thing going in. What could I possibly know? I grew up in Australia, and I live in Canada! So I sat down with a couple of my Canadian pals, and another good friend of mine who grew up in Scotland and now lives in Canada, and we put the game (and ourselves!) through its paces. Like the previous games in this trilogy-of-sorts, players will be guessing/betting on clues of 3 types – for America, this means States, dates (in years) and numbers (from 1 up to 1 billion!). Although these are fairly standardized, they can have some fun implementations; for instance, the Scrabble card didn’t have an actual location for the State, but asked which State would score most in the game, which was pretty neat. At any rate, these three categories offer some wiggle (read: guessing) room. And, in addition to betting on these categories, there’s now an intriguing new addition for players to bet on – against the other players’ guesses! Oh gracious me, be excited, because what’s more fun than profiting from your friends? Ha! There’s a spot for each track where you can bet that no other player will get an “exact” answer (worth 3 points) or the more lucrative but dicey “no exact or adjacent” answer. It’s fun to watch play go around the table and see if anyone seems to have an idea of what they’re doing – and for some cards, a bunch of non-Americans like us really got lucky with betting against our fellow gamers. Regardless of how many players you have for the game, you’ll be playing through 6 rounds (i.e. 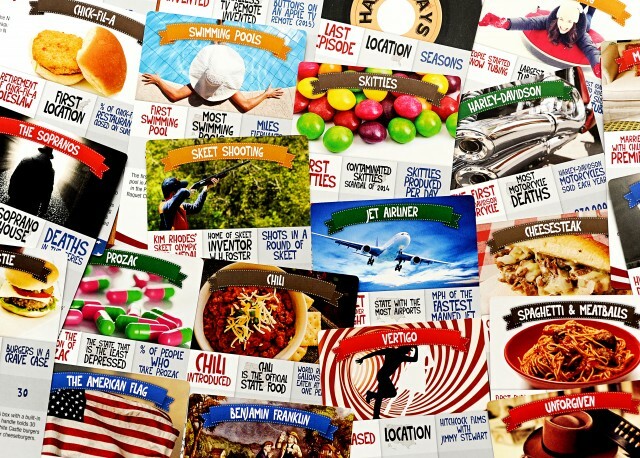 6 cards) as your game. If that doesn’t satiate your need for AMERICA FACTS then I’m sure you could play on past that, as long as your heart desires. We played through 6 cards and didn’t even break the halfway point on the scoring track, so there is plenty of capacity for a longer game, should you want that. Although, beware! I found myself losing far more cubes due to guesses that weren’t even adjacent, so some pacing in your guesses and bets for a longer game could be in order. Overall, pacing yourself is wise in this game – or at least, for my gameplay experience! Taking a stab or two in the dark about States in particular left me hanging, even with getting a betting cube back per round! Perhaps the more I get America to the table, the more cube-savvy I’ll become – or the better my guesses and knowledge will become to make me a master of AMERICA FACTS! I heartily recommend this game for a good amount of fun with a healthy dash of learning. I’ve loved the gameplay of Terra & Fauna because of the cube betting/spatial elements of the board’s map, so this is definitely no different as far as that experience goes. I enjoyed the mix of topics and didn’t feel too lost at any point, even as someone who’s not spent a great deal of time in America – or being America-adjacent, even! 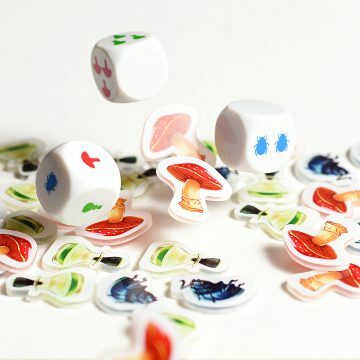 I feel there’s enough variety in topics that a good portion will be semi-familiar to a lot of players – as gamers we’re all familiar with Scrabble, but had to take some fun guesses on the topics covered on that card – so the game will keep you on your toes. Bézier have done a great job developing this one, and I’m curious to see where they’ll take this series of games next. In the meantime, I’ll be brushing up on AMERICA FACTS! 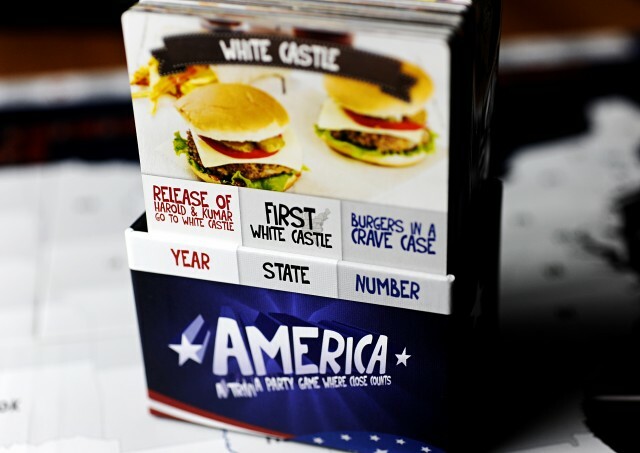 America is a party/trivia game that plays 2 – 6 players in approximately 30 – 45 minutes. 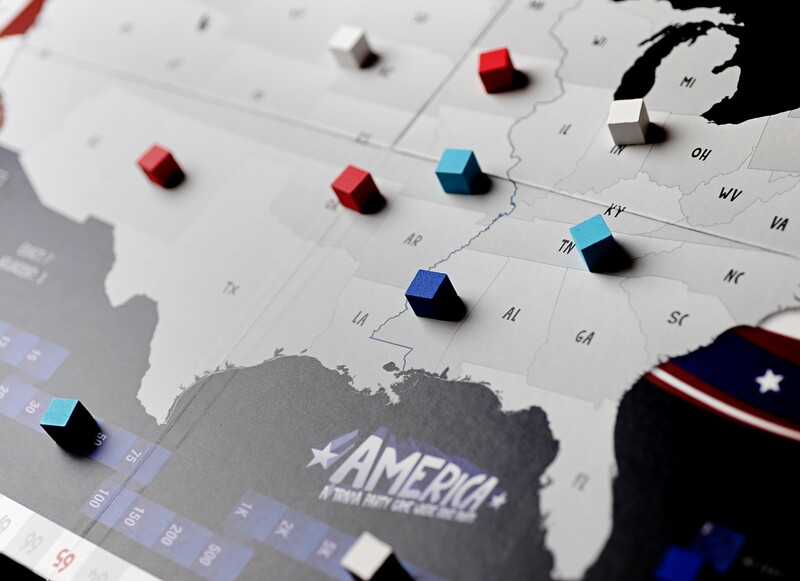 Thank you to Ted over at Bézier Games for sending us a copy of America to try! The game had its release at Gen Con last week, and will be available for retail shortly.